Discover dramatic black-sand beaches, thundering waterfalls and ancient volcanoes and glaciers that typify south Iceland on a full-day tour from Reykjavik! 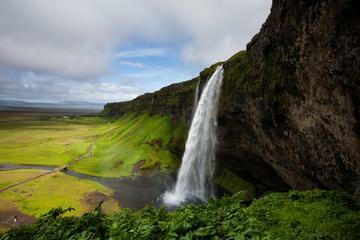 After leaving the city, take a walk around Seljalandsfoss Waterfall, and then follow an expert local guide along Reynisfjara beach. Continue past the 700-year-old Sólheimajökull glacier and ogle the magnificent waterfalls at Skógafoss. The scenic route takes in some of Icelands most rugged and beautiful terrain, passing through the foothills of Eyjafjallajökull and Hekla volcanoes.